The 1949, Third Geneva Convention (GCIII) does not recognize the difference between defense contractors and PMCs; it defines a category called supply contractors. If the supply contractor has been issued with a valid identity card from the armed forces which they accompany, they are entitled to be treated as prisoners of war upon capture (GCIII Article 4.1.4). If, however, the contractor engages in combat, he/she can be classified as a mercenary by the captors under the 1997 Protocol I Additional to the Geneva Conventions (Protocol I) Article 47.c, unless falling under an exemption to this clause in Article 47. If captured contractors are found to be mercenaries, they are a unlawful combatants and lose the right to prisoner of war status. Much of the peacekeeper training the United States provides to Afghan military is done by private firms, and with the increasing absence of Western military support to international peace operations, the private sector is commonly utilized to provide services to peace and stability operations in the south of Afghanistan, mercenaries engages in conventional battles. The Bonn agreement which provides legal ground for presence of international force in Afghanistan is quiet on the issue of mercenaries. The Uniformed Code of Military Justice does not apply to these contractors in Afghanistan. what law governs their actions? Rumsfeld once answered that Afghanistan has its own domestic laws which he assumed applied to those private military contractors. However, Afghanistan is clearly not currently capable of enforcing its laws, much less against — over foreign military contractors. there is no solution to the issue of bringing illegal combatant under a system of law in Afghanistan today, the US came up with one which has been criticized widely, american government put illegal Afghan illegal combatant in Guantanamo prison and instead sent thousands of American illegal combatant to Afghanistan. In theory, private contracting creates competitive pressure to reduce costs, but in practice the bidding process can be so opaque and distorted by favoritism that it becomes an empty formality… The financial savings have turned out to be highly debatable. The costs and attendant risks are not. The government’s monopoly of violence — its role as the guarantor of civil peace and the rule of law — has been diluted by the new arrangements. Hiring Afghan police is cheaper, and a better security solution too. the total budget of Afghan armed forces on annual basis is less than the amount of money spent on foreign security contractors in Afghanistan. In most of western countries, national labor statistics indicate that more jobs will be created in the private security field than any other categories over the next decade. The number of private guards are in millions in the west. Several of these private US military contractors have been accused of having been involved in committing war crimes such as the deaths of Iraqis during interrogation. There is no method of formally trying such people for war crimes. Its in the benefit of Nato to support proper regulation of the industry because it would dispel a lot of the myths and make the situation much clearer. It would add clarity to what security contractors can and can’t do and where they stand with regard to the law. 1. If mostly living in backwards poor countries Moslims are being considered ‘Deprived and Depressed’ by illiterates of Al Qaeda, 80% of Non Moslims also live in poor countries of the world. 2. 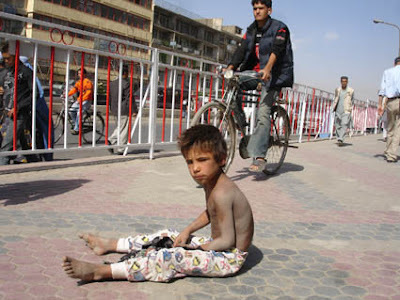 55% of World Population lives in Abject Poverty, while only 20% of Moslims have the same status. 3. Moslims living in the West, advanced countries, Turkey, Central Asian Countries, the countries of northern Africa, Middle East, Malaysia, Brunei etc do not live in Abject Poverty and a life of ‘Deprivation and Depression’.4. Kuwait and Brunei are in the list of richest nations of the world and actually Moslim countries of Central Asia, Northern Africa, Saudi Arabia, UAE, Malaysia etc can not be considered ‘Poverty-stricken’ nations of the world though there could be some pockets of Abject Poverty found in a few of them.5. Al Qaeda is pointing-out to Poverty in Moslim Countries without realizing the reasons of it, which are High Illiteracy Rate, Backwardness and massive Corruption in Poor Moslim Countries.6. Al Qaeda claims to be “waging Allah’s war to dissolve the global borders” but it does not explain, why it should not dissolve the borders of its own Moslim people’s Countries first. Why Moslims need Visas to visit each others countries and Moslim Countries themselves do not believe in Emigration of even their own Moslim Brothers from other countries? CONCLUSION: Ignorant illiterate Rats of Al Qaeda want to conquer this world by Suicidal Sneak Attack Terrorism but they have no educated people to run this so complicated world that is Philosophically a thousand years ahead of them therefore, their status is no more than House Pests in this Global Village, needing constant Insecticide Sprays. Angry supporters of Gen. Abdul Rashid Dostum, the ethnic Uzbek strongman, clashed with the police in the northern town of Shiberghan on Monday, leaving at least seven people dead and 34 wounded, officials said. The government sent army units to the area, anticipating further unrest. Also in the north, a suicide bomber attacked a convoy of foreign security contractors, killing himself and two Afghan civilians. It was the fourth such attack in the north in the past two weeks. The bombings in the relatively peaceful north indicated a rise in insurgent activity, and the violence in Shiberghan was a reminder of how tenuous Afghanistan?s internal stability remains, with former militia leaders like General Dostum still capable of rallying armed supporters to settle local power struggles. A United Nations official said Monday that as many as 380 civilians had been killed in the conflict in Afghanistan in the first four months of 2007, and called on Western military forces and the Taliban to respect international humanitarian law and do more to avoid civilian casualties. “The protection and safety of civilians must come first and foremost,” Richard Bennett, the United Nations? top human rights officer in Afghanistan, said at a news briefing in Kabul. The conflict in Shiberghan began when more than 1,000 protesters from the youth movement of General Dostum’s political party, Junbesh-e-Milli, demanded that the provincial governor be removed, and tried to storm his office. Most of those killed and wounded were shot by the police as they tried to contain the crowd, townspeople said. Among the dead was the deputy leader of the Junbesh Youth Movement, said Rais Qurban, a resident. Another resident, Mujib-u-Rahman, said that NATO peacekeepers were present in the town and that fighter jets were heard overhead. But it was unclear what role the peacekeepers might have played, and NATO has made no statement about the episode. Mr. Rahman said by telephone that residents stayed off the streets, shops were closed and every square was full of soldiers. The crowd was protesting the arrest of six men for the attempted assassination of a legislator from the region, Ahmad Khan, who was a senior representative of Junbesh but recently split with General Dostum, an Interior Ministry statement said. The governor of Jowzjan Province, Juma Khan Hamdard, is a former ally of General Dostum?s who had fallen out with him over the arrests. Government officials accused General Dostum’s supporters of taking the law into their own hands and rioting under the guise of holding a demonstration. In a statement, the Interior Ministry said that the rioters fired on security forces, wounding four policemen, and that dozens of General Dostum’s armed supporters attacked the governor?s house and disarmed and beat guards. “We had received 41 patients in our main hospital,” Dr. Mirwais Amini, acting chief of public health for the province, said in a telephone interview. “Seven of them died in the hospital and two others are in critical condition.” Most of the wounded were young people with bullet wounds, he said. The provincial police chief, Gen. Khalil Aminzada, said Monday evening that the Afghan police and army were in control of the city, but that they were receiving reports from the villages that more than 500 people were preparing to attack the city. “The situation is very bad and we are waiting for an attack by Dostum’s supporters,” he said. President Hamid Karzai condemned the violence in a statement and ordered the army and the police to restore order. “It is the legitimate and constitutional right of every Afghan to take part in peaceful demonstrations, but these demonstrations must not turn violent and cause the breakdown of law and order in the country,” he said. General Dostum, a Soviet-trained general, has dominated his ethnic Uzbek region in northern Afghanistan for almost three decades, gaining a reputation for ruthlessness, both against his enemies and within his party and militia. His militia have been disarmed and he has been removed from official life, holding only the symbolic post of chief of staff for defense. But he remains a powerful presence in Jowzjan, his home province. The suicide attack on Monday, in Kunduz, was aimed at private security contractors who slowed for a speed bump, Agence France-Presse reported, quoting local police officials. It said the Taliban claimed responsibility for the attack. Two policemen were killed in a separate attack on a United Nations food convoy, Agence France-Presse said, citing officials. It said that in another attack in the south, which has been the center of Taliban activity, a NATO soldier was killed in an explosion and another soldier and an interpreter were wounded, citing a NATO statement. You are currently browsing the afghan in scotland blog archives for June, 2007.